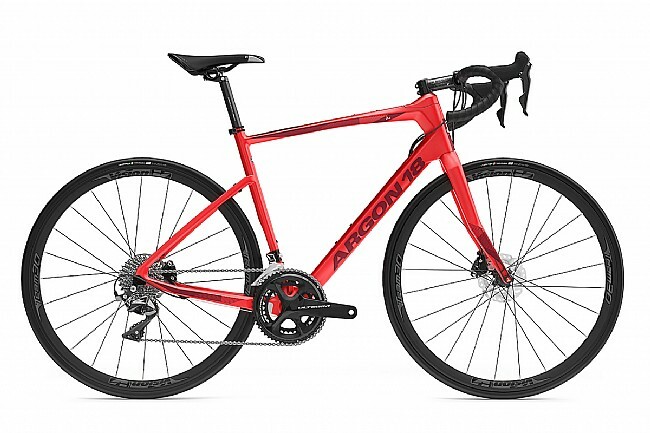 The Argon 18 Krypton CS is a true endurance bike design with a geometry tuned for long days in the saddle. Its new layout offers a stable and comfortable ride with a relaxed rider position, while keeping true to Argon 18's performance heritage. It will take you wherever the road may lead. Headset: FSA 30 + 3DPLUS 1" 1/2. Front Derailleur: Shimano Ultegra R8000 Braze-on. Rear Derailleur: Shimano Ultegra R8000. Crankset: Shimano Ultegra R8000 50/34t. Bottom Bracket: Shimano SM-BB71-41B Press Fit. Cassette: Shimano Ultegra R8000 11/32. Chain: Shimano Ultegra HG-700 11s. Brake rotors: Shimano RT800 160 front / 140 rear. Seatpost: Argon 18 carbon 27.2mm. Wheelset: Vision Team 30 Disc. Front axle: 12x119mm thru axle. Rear axle: 12x161mm thru axle. Tires: Challenge Paris Roubaix Plus 700x27.